Taking the rights away of a law abiding citizen. This is BS. Don’t mess with our rights. Send me updates on this bill. Vote no for bill HF-125. Always serve the people and protect the constitution al rights of all Americans. And preserve our 2nd Ammendment to protect our families and to hunt . Thankyou. Vote no for bill HF-125. Always serve the people and protect the constitution and rights of all Americans. And preserve our 2nd Ammendment to protect our families and to hunt . Thankyou. Hittler and his cronies did the same thing, as to disarm their citizens. Then rule over them with a brutal iron fist. The Democratic party is a mirror image of the 3rd Reich. By proposing such ridiculous legislation, they have, in my eyes violated their oath of office, and should be treated as the anti American garbage they are. Do you people know what the 2nd amendment is you want to get the 2nd gone what is next? None of you have probably ever handled a weapon but you think you know what it best for the people. How many people were killed in Iowa last year with these weapons? I thing maybe we should take everyone’s cell phone I bet there were more people died from useing cell phones in cars. So you should use your heads and common sense.you can not protect everyone from everything!!!!!!! Why do the Democrats have this insatiable urge to tell everyone else how to live their lives? I agree with Terry. We do have a law that is on the books that ban texting and now we need one to ban cell calls that an not be taking on a hands free device. Maybe we need to ban drinking as drunk drivers kill people too, or maybe we should ban safe drivers so they won’t be in an accident with a drunk driver and get hurt. Just thinking! Typical libtard attacking a taxpaying, law abiding citizen and attempting to impose their tyranny on us. As an Iowan, your efforts should be directed at a crime fighting bill and going after criminals. I’m sure you feel safe with semiautomatics in the Capital just like we feel safe with them in our homes. Bruce, Art Mary, Jo and Vicki look like five turds that are floating in Diane Feinsteins stool. GOD Bless America. MAGA!! Shall not be infringed. Back off already. The goal is to disarm the population. Just like in Germany in 1940s. We know how that worked out. The younger generations think that can’t happen in USA. This is more standard liberal BS that they are trying to pass! Trying to attack our liberties that we are granted. 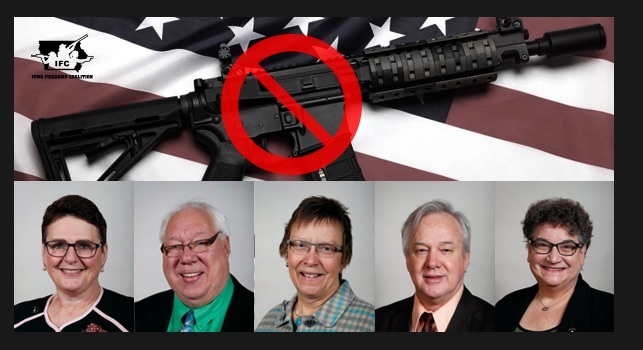 These are just gun_haters that probably have never handled firearms and just want to push their agenda and disarm law abiding iowans and thinking that they are saving lives . Bruce hunter told me that by banning hi cap magazines lives can be saved. This kind of Bloomberg style legislation immediately!!! I meant to say stop this legislation immediately! Wasting time & taxpayer money trying to pass laws that are unpopular, unenforceable & drafted in the most obvious form of willful ignorance to realistic functioning firearms. Beneath our beautiful gold plated dome lies a hive of scum and villainy. An amendment to protect our gun rights was signed into law last year by the Governor, or am I wrong?